The first time I read Owl Moon by Jane Yolen I hoped one day I would get an opportunity to go owling. 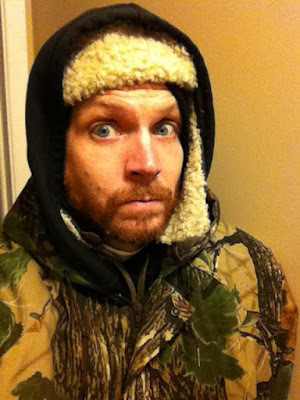 It is hard to read the book and not want to get bundled up in warm clothes to go for a hike in the woods to call an owl. I finally got my chance to go owling last month. 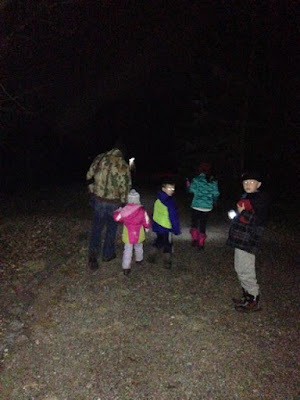 Our local nature center advertised an opportunity for families to go for a guided hike at night to call owls. I signed up our family right away. 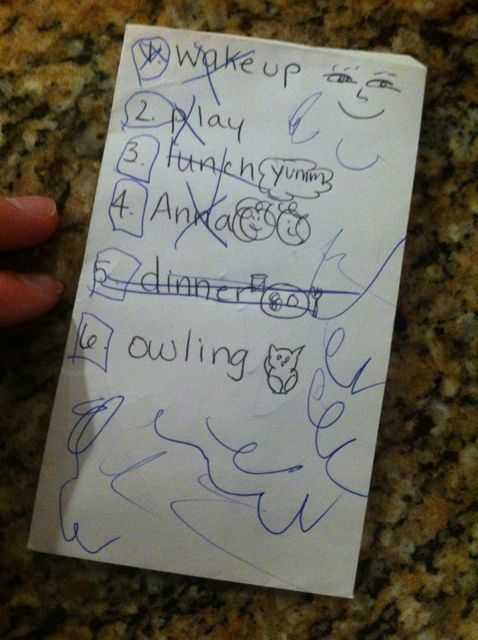 My four-year-old daughter was very excited to go owl hunting. She told her friends at school that was what she was going to do. She even invited them to come along. One of her friends was disturbed by the invitation, "I don't want to kill an owl." I explained to her that hunting implies shooting even though hunting to you means trying to find. She didn't care. She continued to tell everyone that she was going owl hunting. Our schedule for the day. My daughter always needs a schedule when an exciting event is coming up to help her understand when it is going to happen. One of my daughter's friends came over to play the afternoon before the owling event. I received a text from the friend's mom that day. It went something like, "[My daughter] is so excited to come over. She can't wait to go owl hunting." Owl hunting? Oh. Yeah. Owl hunting. I anticipated this confusion and didn't panic. I had a plan. I thought that we could really have an "owl hunt" so I pulled out a craft idea from an author birthday celebration many years ago. 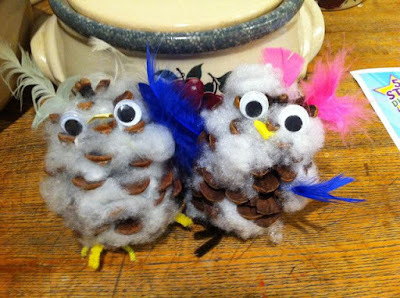 When my daughter's friend came over we made owls out of pinecones, read Owl Moon, and then I hid the owls around the house. They "hunted" for the owls. Preschoolers are the best! So are these owls! and for a moment we both listened. 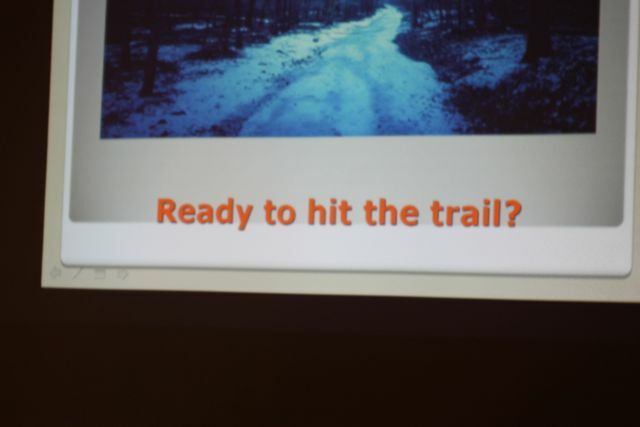 The event at Moebius Nature Center began with a short presentation about owls given by the nature guide. We learned Ohio is a very special place for owls. 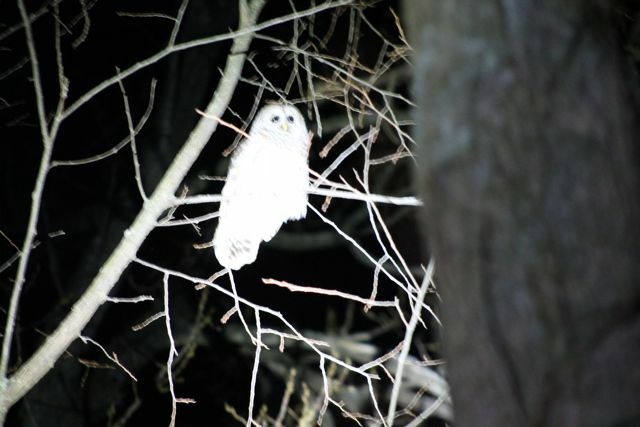 Twelve different species of owls have been seen in our state. At the end of his presentation he asked, Are we were ready to hit the trail? All four of my children, my wife, and numerous other families with small children went for a hike in the woods. I remembered from Owl Moon, "If you go owling you have to be quiet, that's what Pa always says." My children were noisy. The whole group was chatty. I thought, an owl would be crazy to come near us. To my surprise, our guide read Owl Moon to the whole group in the middle of the woods by night vision light. It was awesome! Then, he called for owls just like Pa. Whoo-whoo-who-who-whooooo! And just like Pa, our guide was successful in finding an owl. Amazingly, an owl came into view minutes after our guide finished reading the book. I had never taken photos at night before. 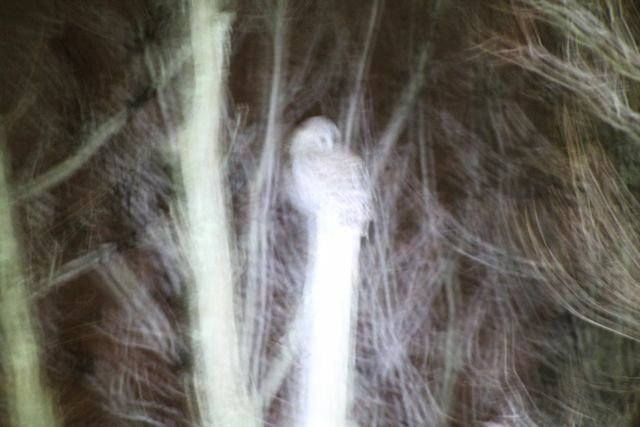 This was the best photo I took of the barred owl. 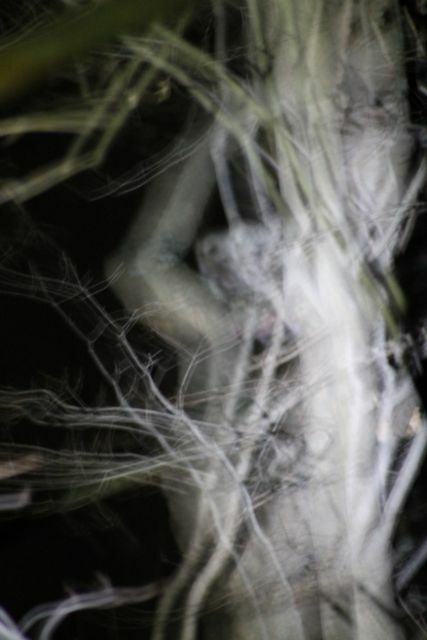 I knew my photos were going to be blurry. 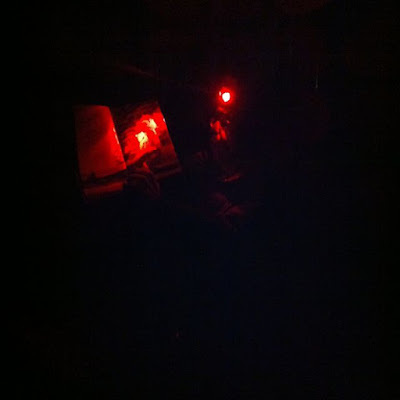 So, I tried to take a video of the experience, but I left the lens cap on. Bummer! However, the audio is great as it captures the excitement as the owl flew overhead. Another blurry photo of the barred owl. A barred owl is different than the Great Horned Owl in Owl Moon. The next night the nature center had another owling event, but this time for adults. My oldest daughter and I decided to go owling again. I wanted to see if I could get a better photograph and maybe another video. This time with the lens cap off. After a longer hike deeper into the woods, I was wondering if I would get my chance. Our first location was unsuccessful. No owls. Not even a hoot. We moved to a new location and our guide called with his voice and used an app on his phone. He called more. We were patient. Then an owl came and I was ready with my camera. Yay! I took the lens cap off! The barred owl hung around for a while. At one point it perched on a dead tree right above me! 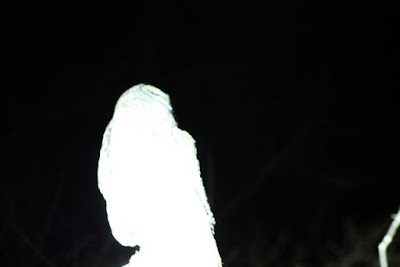 I once again left my lens cap on for a video, but I did capture our guide calling an owl. Then, at the end of the clip, two barred owls bark at each other. I want to thank the Moebius Nature Center for providing this opportunity to go owl hunting, er, owling. My family will never forget it. Thank you, Jane Yolen, for writing this book. Without it, I would have never had a desire to go owling. Important Note: I learned that if you want to go owling in Ohio to celebrate Jane Yolen's birthday you should plan your hike in January. In February, owls begin their nesting season and it would be unkind to interfere with this process.